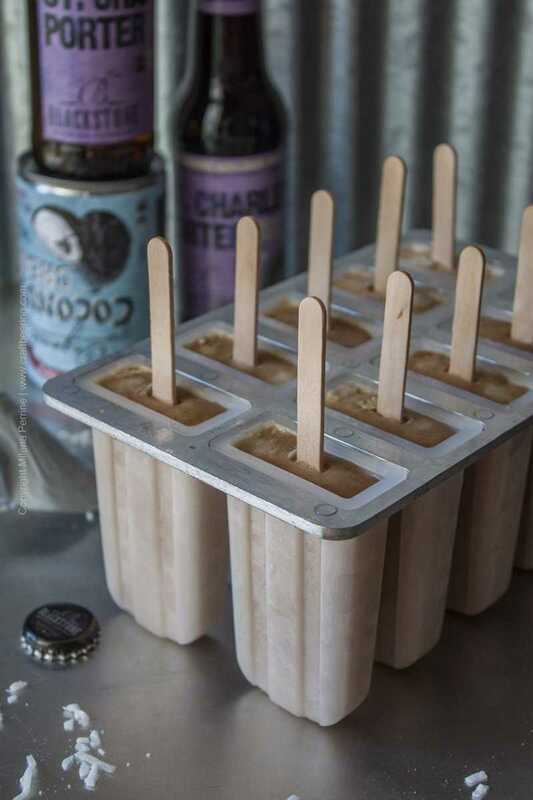 These porter beersicles can easily become your favorite popsicles. Sweet brown porter is reduced to a syrup & blended with rich coconut cream and shavings. I still cannot get over how rich and chocolate-y they turn out even though they do not contain a spec of cocoa. This is the magic of an expertly crafted brown porter, or if I had to go even deeper, the magic of roasting malt to chocolate perfection. I’m always fascinated by the flavors that drying and roasting malted barley creates. (If you enjoy porters, check out these two recipes: Coconut Porter Pancakes and Chocolate Porter Pizzelles). In this delightfully easy recipe the only cooking with beer you need to do is to simmer the porter with brown sugar for about 15 minutes. The flavor of the porter gets concentrated as the ale is reduced and the brown sugar lends additional sweetness to the chocolate-y tasting simple syrup. I cooked down the porter to about two thirds of the original volume, approximately 8 oz. The choice of porter will drive the flavor profile of the beersicles as much as the use of coconut milk, so the point is to select a porter (or you can go with a stout) that you find tasty on a personal level. If you want to amplify the Almond Joy flavor look for an ale with pronounced chocolate notes. I used Blackstone Brewing St. Charles Brown Porter. It has very low bitterness and moderate alcohol content (IBU 34, ABV 5.8%) and is loaded with chocolate flavor. Brown porters as a style are an amplified version of brown ales, very sweet but with more robust caramel and chocolate notes. The English hops traditionally used to brew brown porters contribute earthier flavors which only slightly bitter the maltiness of the ale. The St. Charles specifically is an excellent representative of the style and is the most decorated brown porter in the history of the Great American Beer Festival. The sweet malty base is flavored with Centennial and Willamette hops, just enough to counter the sweetness, but not seriously stand up to it. On that note, you can customize the sweetness of the beersicles as per you preference. I tend to be generous with brown sugar, including in this recipe, but how much you use it totally up to you. If you want to skip the sugar altogether, go for it. The beersicles will taste just as rich with the syrupy reduced porter and the naturally sweet coconut cream and coconut shavings. I actually used sweetened shavings on top of adding brown sugar, because to me making something that will resemble Almond Joy demands and justifies the extra effort in sugar management. 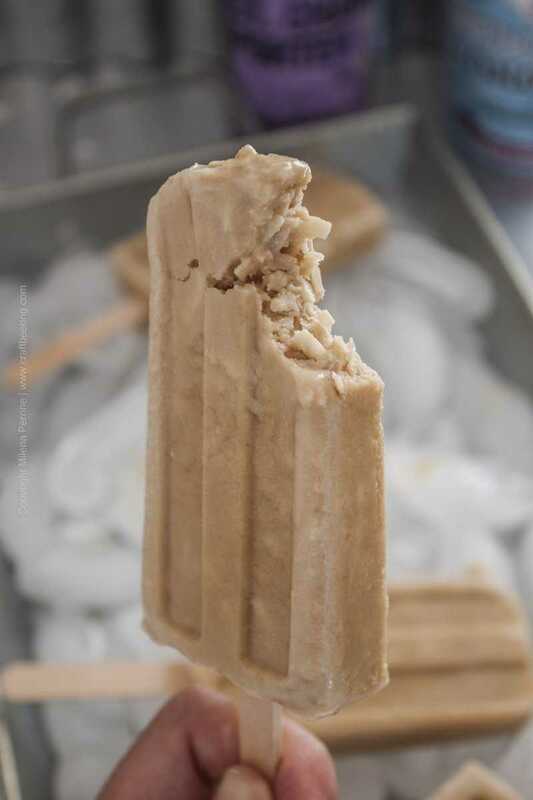 Even though most popsicles can be frozen for only six hours, I recommend that you leave these in the mold overnight before getting them out. The beer simple syrup requires a little longer to freeze into beersicles and even though my popsicle mold is a rock star, the extra time in the freezer really helps. 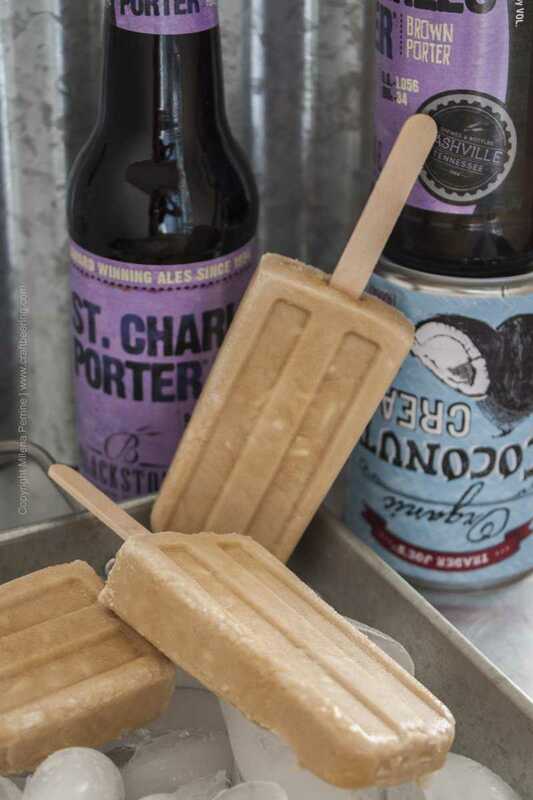 Rich, chocolate-y and creamy these beersicles (beer creamsicles if you'd prefer) hit all the right spots. Reminiscent of Almond Joy, but with an extra flavor dimension. Must try. In a small pan over medium-high heat bring the porter to simmer and dissolve the sugar in it. Let simmer until the liquid is reduced to 8 oz (about 15 min) and removed from heat. Let the porter 'simple syrup' cool off. Mix the coconut cream and shredded coconut in a container with a spout, such as a pitcher. Add the cooled off porter syrup and incorporate it into the mixture. Pour the mixture into your popsicle mold - you should have enough to fill up a 30 oz mold. For best results, freeze overnight (12 to 14 hours) before serving. 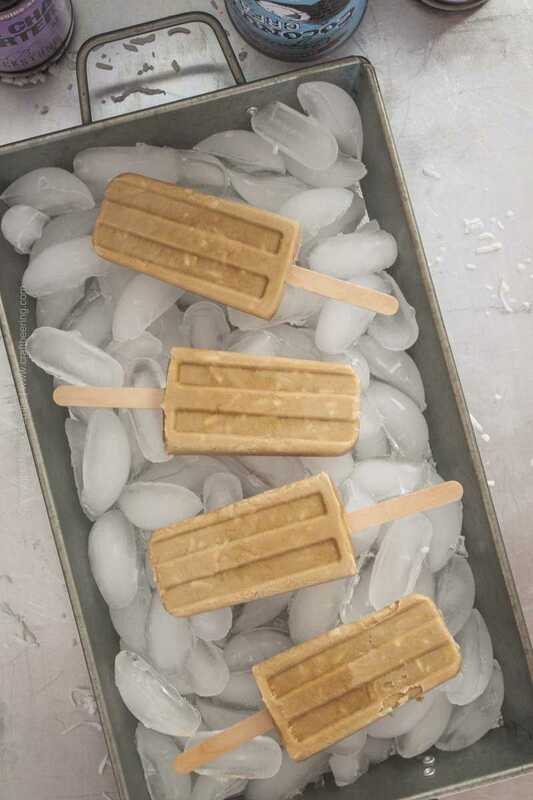 I love homemade popsicles! And the combination of porter and coconut sounds interesting. I’ll have to give it a try! Thanks for sharing at Sew It Cook It Craft It. You’re one of my features tomorrow. These look so creamy and yummy! I would never have thought of using beer for pops! 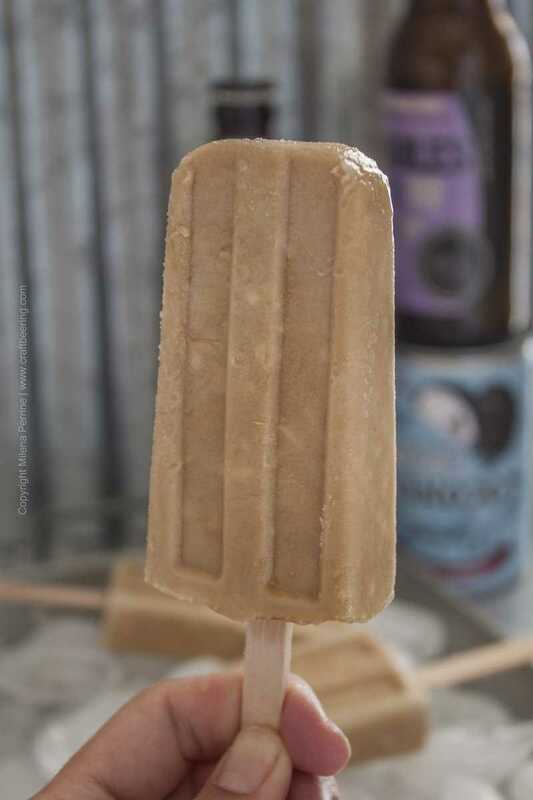 🙂 Oh, there are so many options:) We love boozy pops, lol. You can call them anything….just don’t call me late to the party when you’re serving them! So creative!! Pinned! oh my gosh these look amazing! I’ve been meaning to get a popsicle mould for ages, so many great ideas!! Thank you, Georgie. They taste much better than they look, lol. So easy to make. 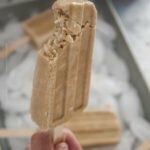 We’re loving the popsicle mold – sometimes I just puree fruit, add honey or agave and kiddo has healthy popsicles in a few hours. Thank you for stopping by! I LOVE the idea of a beer creamsicle :). These are just the most perfect summer treat I can imagine! Have a great weekend, Milena! First of all – I love that name ‘beersicles’. I think you made a good choice there 😉 And porter? Love it! What a great idea reducing it down! I can only imagine that concentrated flavour! Paired with coconut, I bet this is one decadent treat, perfect for a warm summer day like today. Pinned! I know hubby will LOVE these too. P.S.I have to get a new pop mold and this one looks like the right one. Have an awesome weekend! Cheers!